(Bloomberg) -- Canada’s government bonds rallied and the loonie tumbled after the nation’s central bank pointed to signs of slower-than-expected growth as it left borrowing costs unchanged, leading traders to trim bets for a rate rise in January. The yield on the country’s two-year government bond fell as much as 7.4 basis points to a two month low of 2.044 percent, the biggest slide since May, while the Canadian dollar sank to the weakest since mid-2017. The market-implied probability that the Bank of Canada raises rates next month declined to about 37 percent from about 55 percent Tuesday, based on OIS. 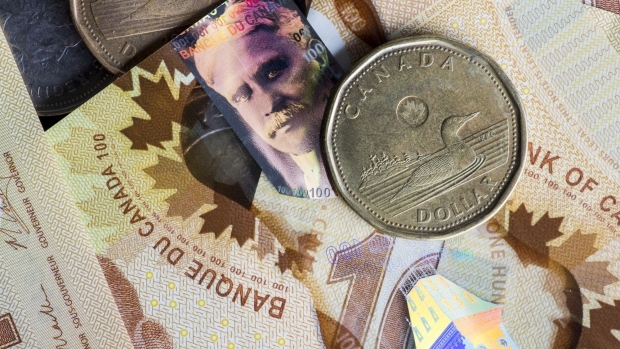 The Canadian dollar weakened as much as 1 percent to C$1.34, and is now down 6 percent this year versus the greenback. The Bank of Canada kept its overnight rate at 1.75 percent on Wednesday but noted global trade frictions and oil-production cuts in Alberta as forces dampening its outlook. Canadian stocks extended gain after the statement from the Bank of Canada, with the S&P/Toronto Stock Exchange Composite Index rising as high as 1.3 percent.